On Tuesday, Jan. 29 at 7 p.m. in Champlain’s Alumni Auditorium, a showing of Noyana – Singing at the End of Life will be held. The film is a half-hour documentary produced and directed by Keith Oppenheim about the work of the Noyana Singers, a local group that sings to terminally-ill residents at Respite House, a hospice house in Colchester. The Noyana Singers at Respite House. Oppenheim, an associate professor in the Broadcast Media Production program, completed the film in the fall 2018. 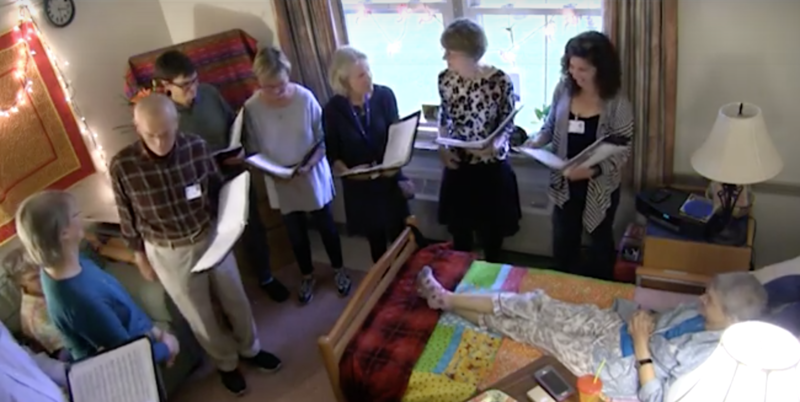 The documentary includes interviews with members of the Noyana Singers, staff from Respite House and notably, residents who were the recipients of Noyana’s music that have since passed away. Following the showing of the film, there will be a brief discussion led by Tara Graham and Charley MacMartin from the Visiting Nurses Association. In addition, on Thursday, Jan. 31, Noyana – Singing at the End of Life will air on Vermont Public Television at 7 p.m. as part of the Made Here series, a showcase of regional filmmakers.